It was a very nice evening. 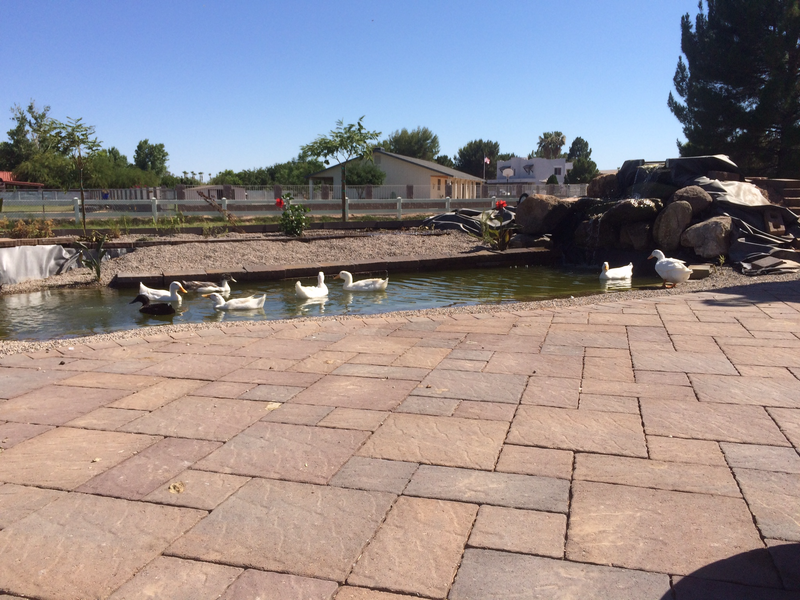 The weather cooled down to a nice 87 degrees with a cool breeze that made sitting on the porch watching the animals quite nice. Memorial day weekend has been really nice thus far. I am grateful for all those who gave their lives, spilled their blood and sacrificed family and home so that I have the freedom to sit on my porch and contemplate the blessings of life. Nothing like grazing on fresh bermuda grass in the back yard. . . 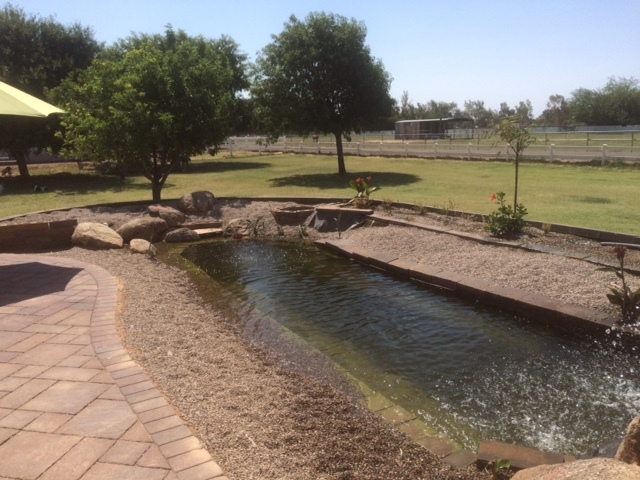 Even the Koi were happy to see the horses . . . Even the rooster enjoyed the evening. 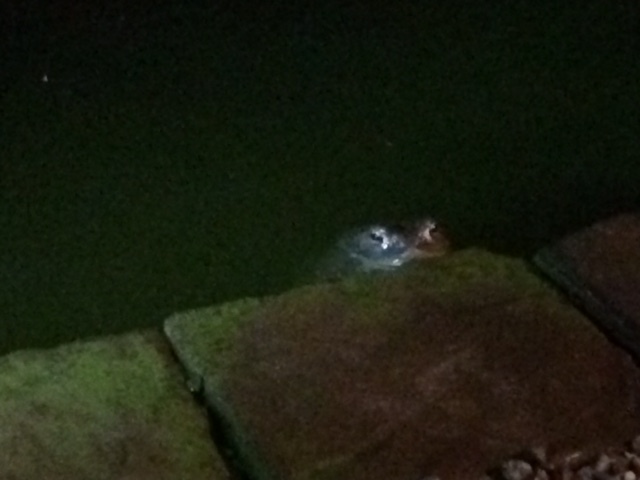 . . while eating a few bugs out of the pond growbeds. There is something amazing about sitting on your back porch with your animals and feeling the breeze on your face as the sun sets in the background. 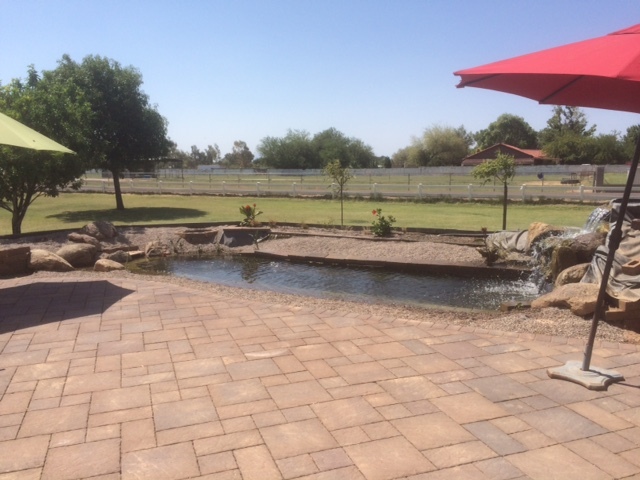 I hope that your Memorial Day weekend is as tranquil and beautiful as mine. And, if you or your family have served in the Armed Forces, from the bottom of our hearts, the Nally family salutes you! Happy Sunday . . . from the Perspective of a Puggle. Good morning!! My name is Gracie. I am Adam’s trusted Puggle. I just wanted to show you around the farm this morning. Adam’s been pretty busy lately with all the chores and his office and trying to be a human. I thought I’d show you what it looks like from my view. So, follow me . 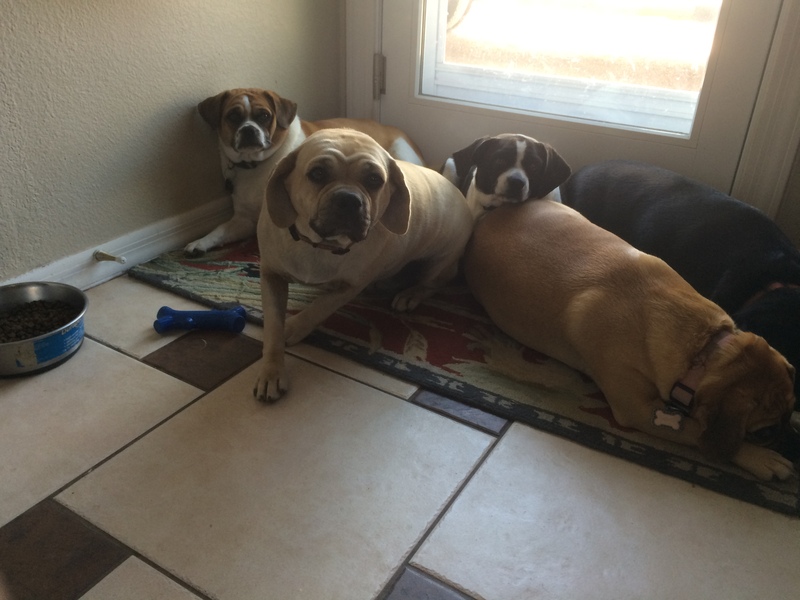 . .
Much of the day is spent by my pack just napping in the kitchen. You know . . . Arizona is HOT! It’s 108 degrees out there right now. 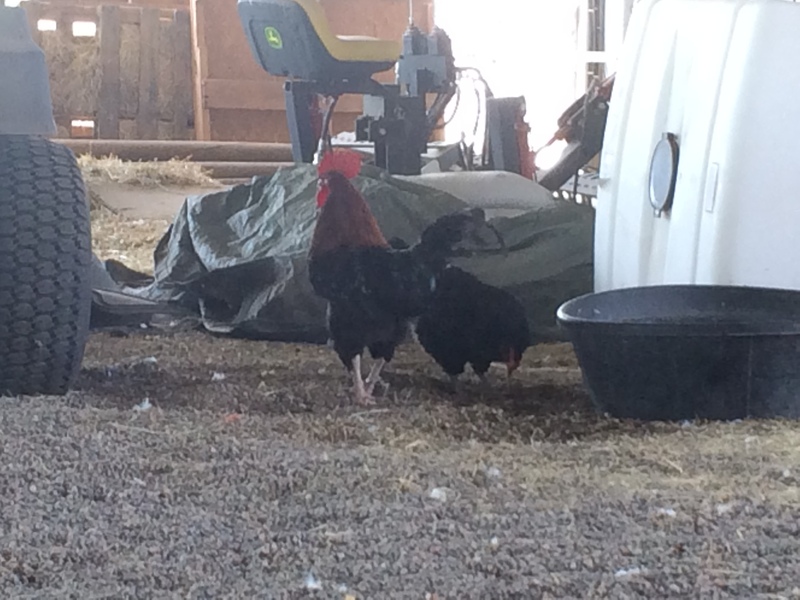 But when I do get up and run around, I get to visit the chickens. This is Rudy. He’s the rooster that takes care of all the chickens. He also wakes me up at 4am . . . what a bird brain. 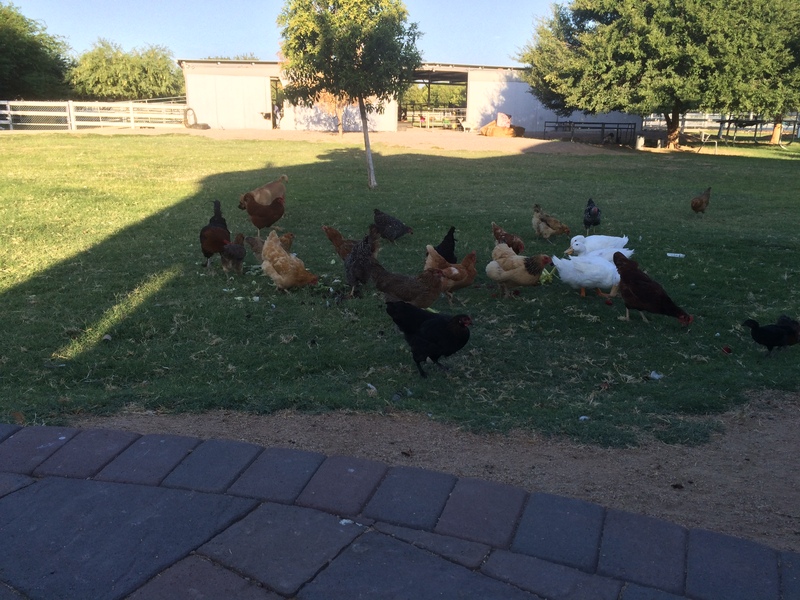 Rudy chases around his 20 hens and seems to keep them in line. 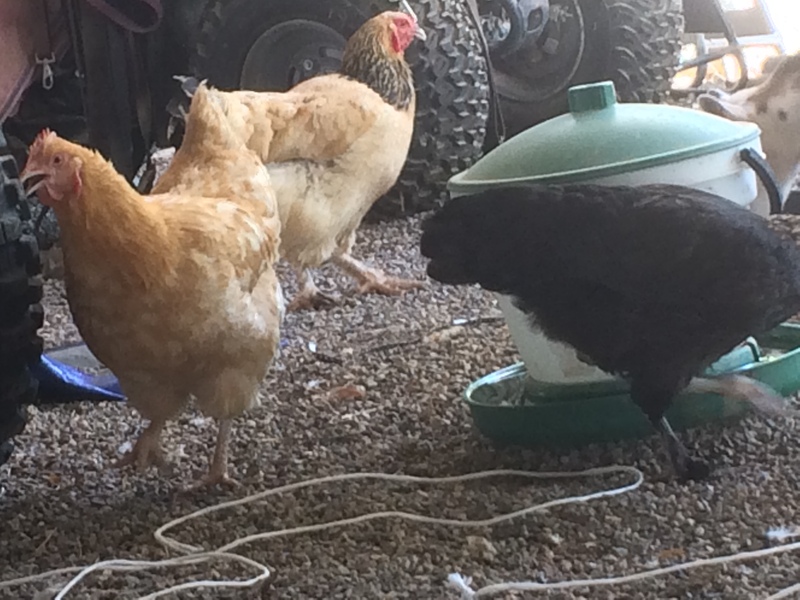 These three hens follow Adam around begging for food . . . now that I think of it . . . maybe they think they are dogs? This is Annie. 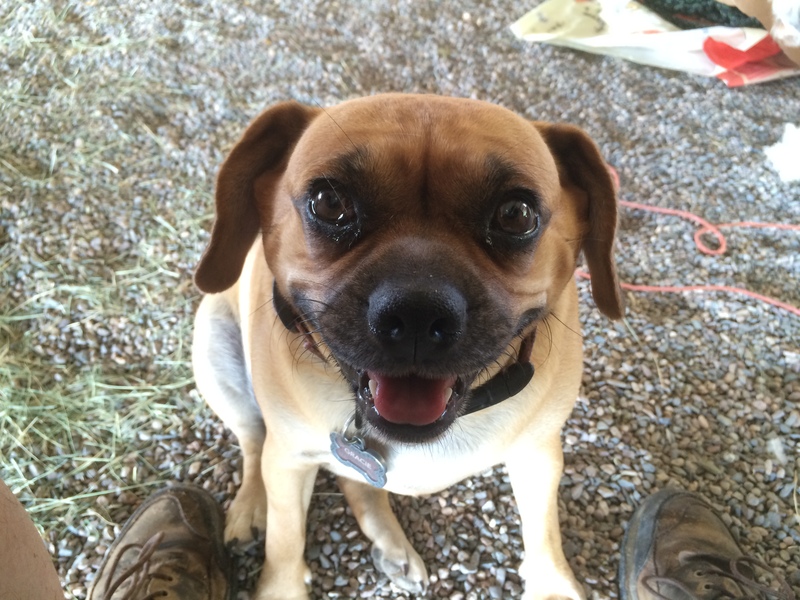 She’s not a puggle like me, but she seems like a true farm dog. She likes the chickens too. 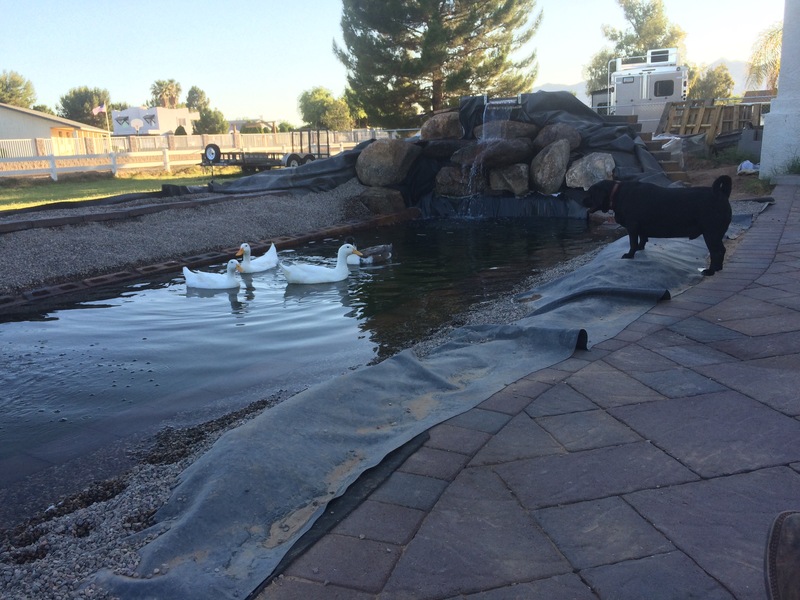 In fact, she likes to wait until all the chickens are gathered into one spot and then runs full blast into the middle, scattering the chickens . . . she calls it “chicken bowling.” Can you see her grinning? Adam has a really nice mate. He calls her Tiffini. She came home with two of these furry small whiney things. Tiffini calls them “kittens.” They named them Aravis and Mini. All they ever do is drink milk and poop in a gravelly thing that smells terrible. 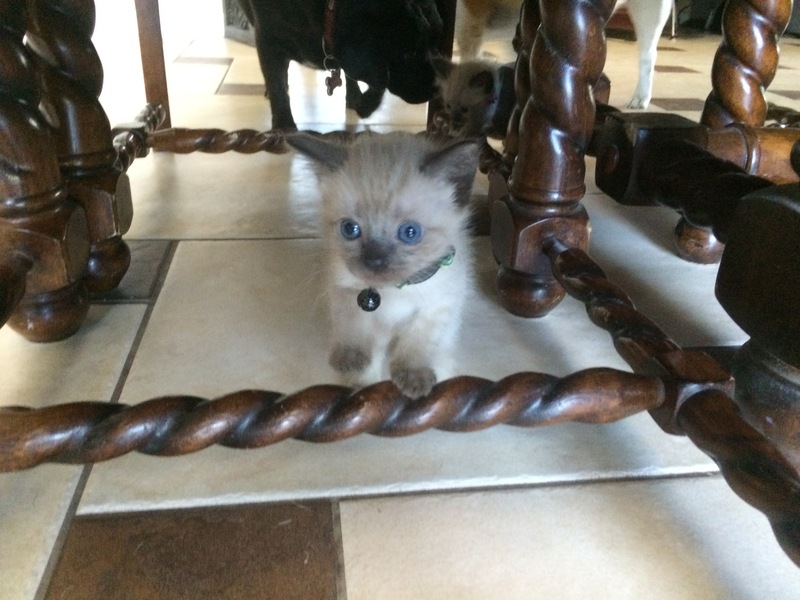 They have blue eyes and when I look at them they smack me in the nose with their claws. I’m not quite sure about them yet. 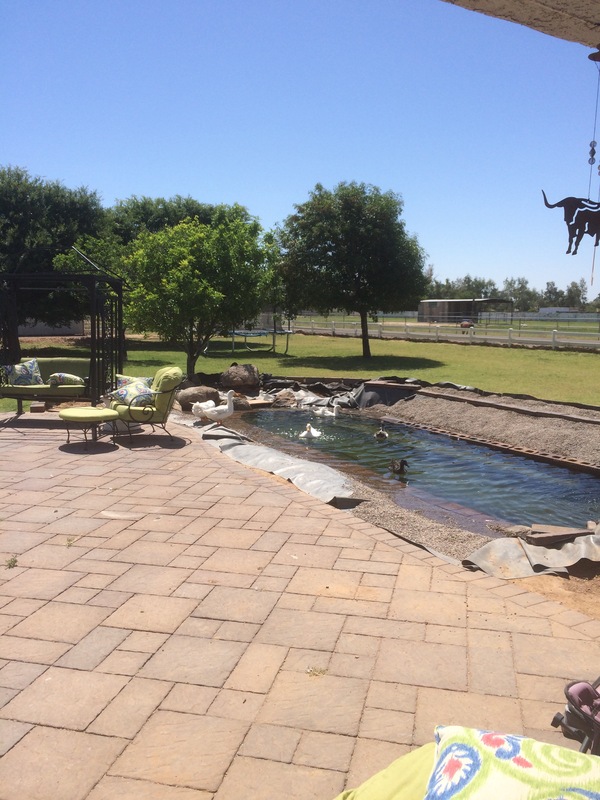 When it is hot, the ducks get into the pond and bath. Somehow, they can stay on top of the water. Every time I’ve gotten in . . . I sink. Isn’t fair . . . but the water is always cool. Sometimes, Tiffini empties out the leftovers from the big cold food container called the “fridge” onto the lawn. The chickens and ducks love that. 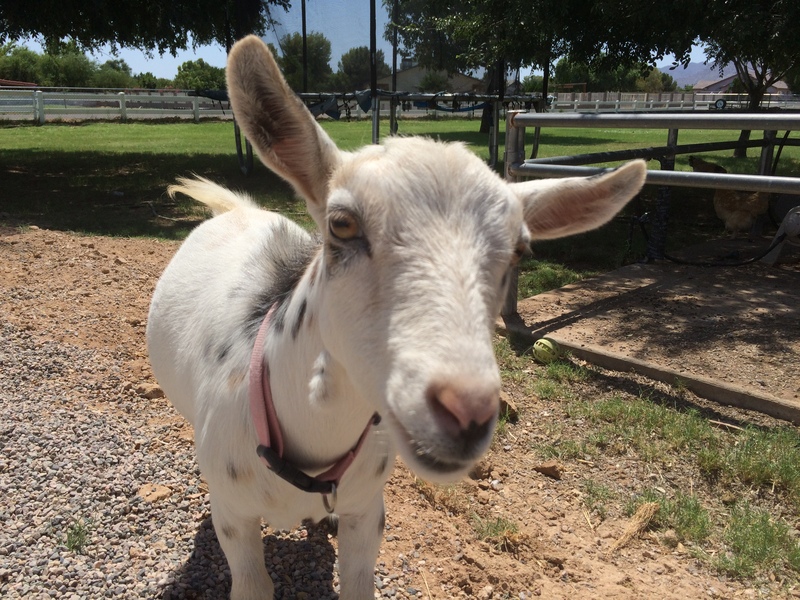 Oh yes, I can’t forget to tell you about the goats. They eat everything. I think that they’d even eat my ears if I remained still long enough. This is Daisy. Her head is quite hard. That’s all I’ll be saying about that. 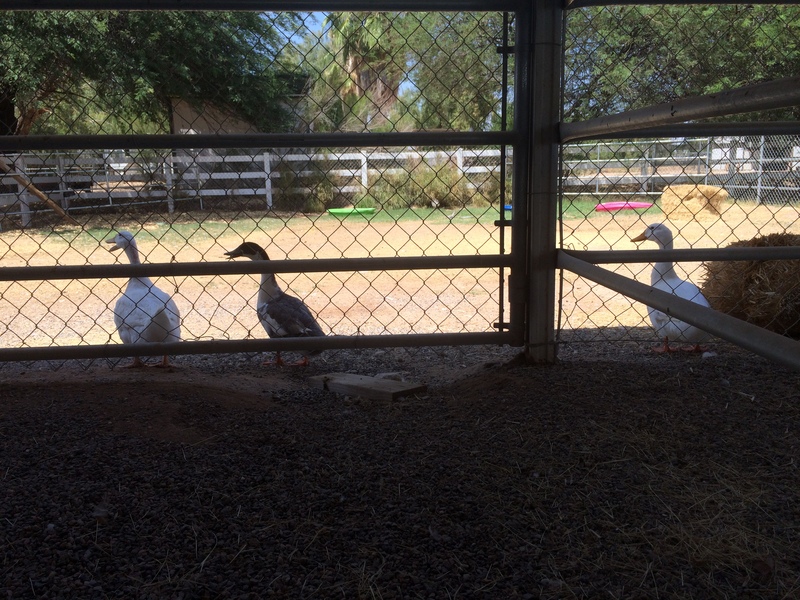 Did I tell you about the ducks? They have the ability to create a mud hole out of a teaspoon of water. But their eggs are quite tasty. 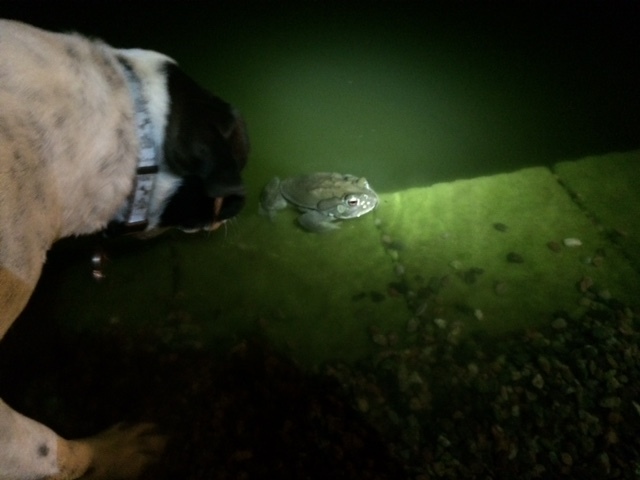 Oh, the fish . . . I can’t forget the fish . . .
Adam calls them Koi. I’m not really sure what that means, but they are really cool to watch and they taunt me . . . constantly. However, Adam seems to want to keep them around because their waste feeds the plants and the plants clean the water. 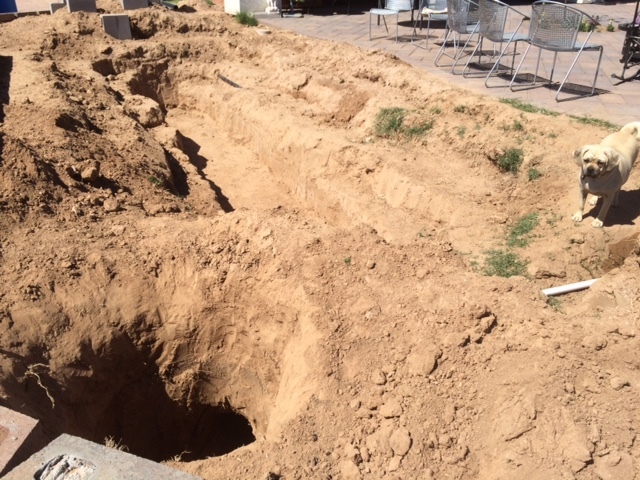 Adam says that it’s an aquaponics thing. I just know that I prefer the taste of the water to tap water. But it’s not all fun an games around the farm. Occasionally, we have a few visitors. Gophers that is. 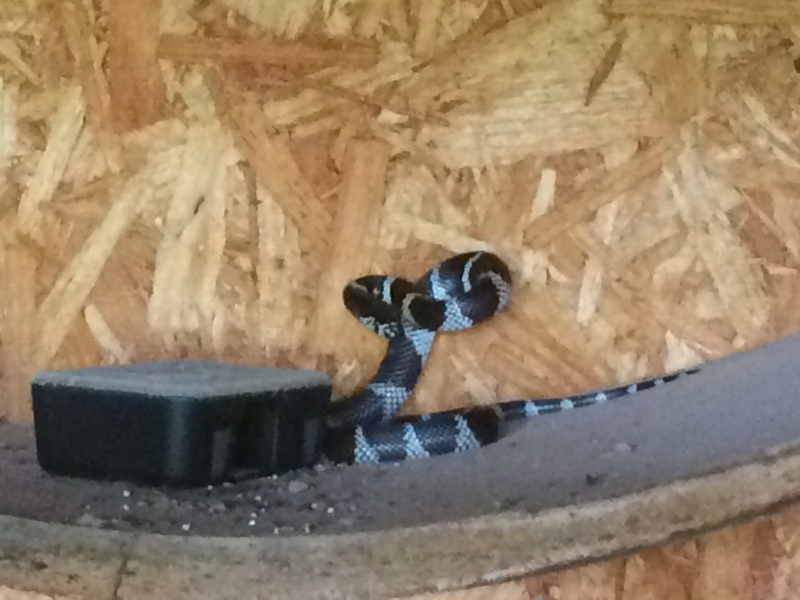 Meet George, the King Snake. He climbs. He climbed up on an old shelf in the tack room this morning to catch the mouse that’s been living there. 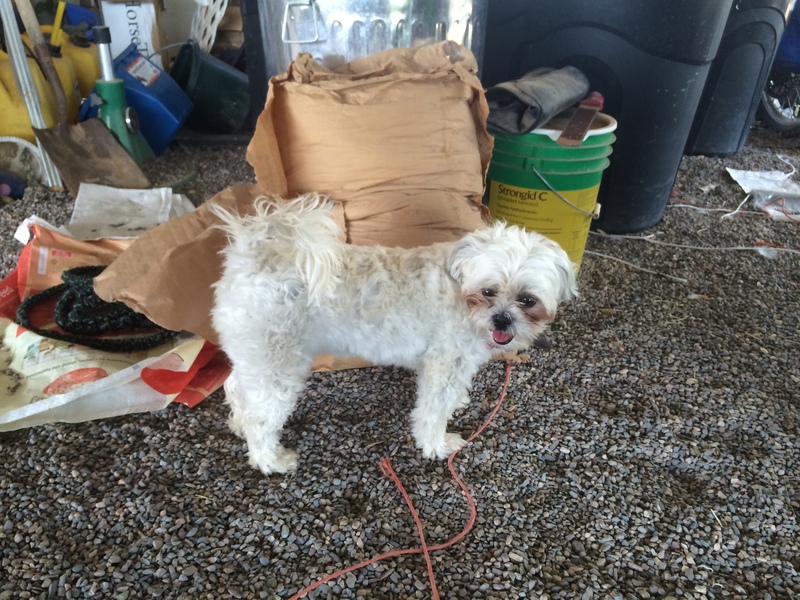 He chases mice and gophers . . . Oh, and he eats them too. Well, that’s the farm. Come, again, and visit. Hope you have a really nice Sunday. 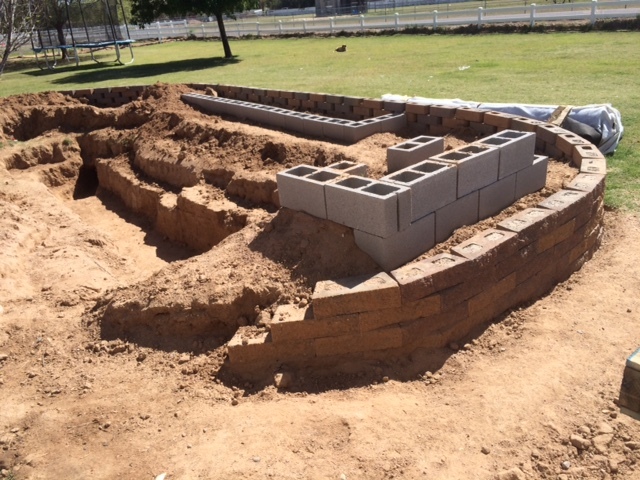 Had a little time yesterday to work on the second grow bed. 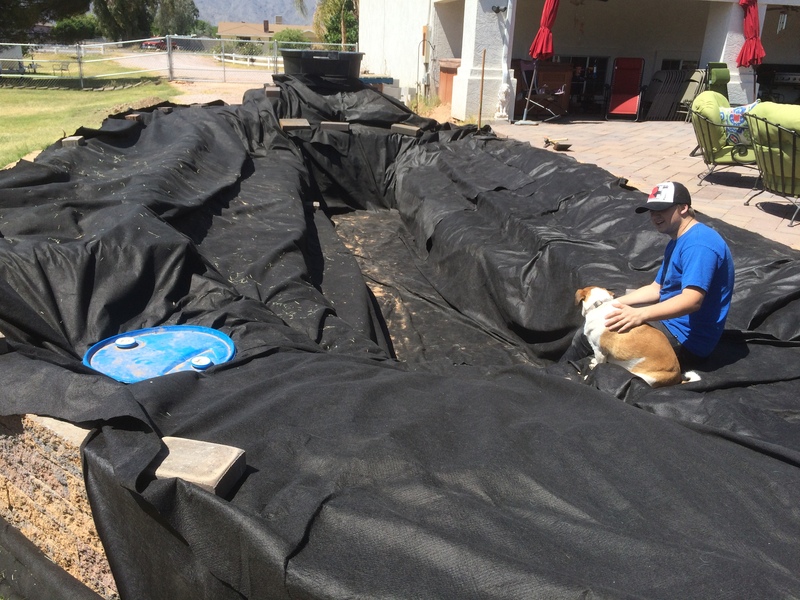 Placed an 8×16 foot liner in the grow bed area that sits a foot above the pond. 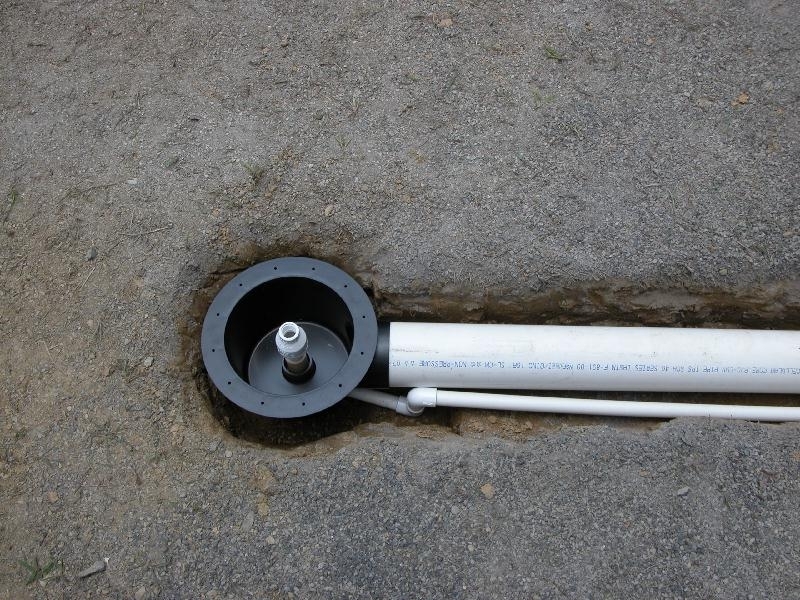 After leveling it out and dropping the liner, I transferred my 1″ siphone over and plugged it in. I filled the grow bed with water and then brought in my gravel. You can see the finished images below. 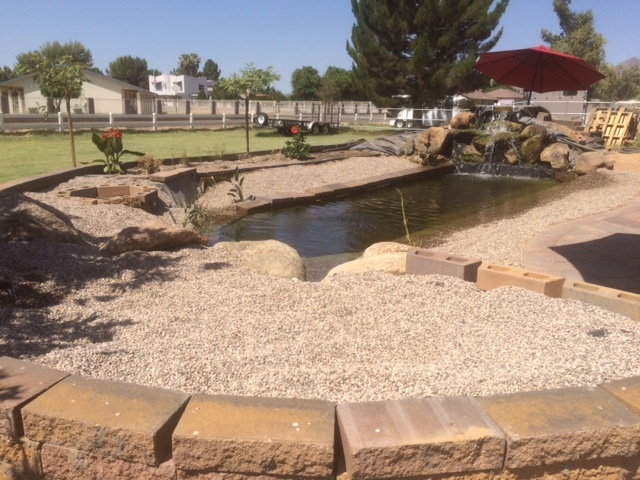 As you can see, the algae bloom is cleared up and the pond is doing fantastic. You can almost see the bottom of the pond clearly now. 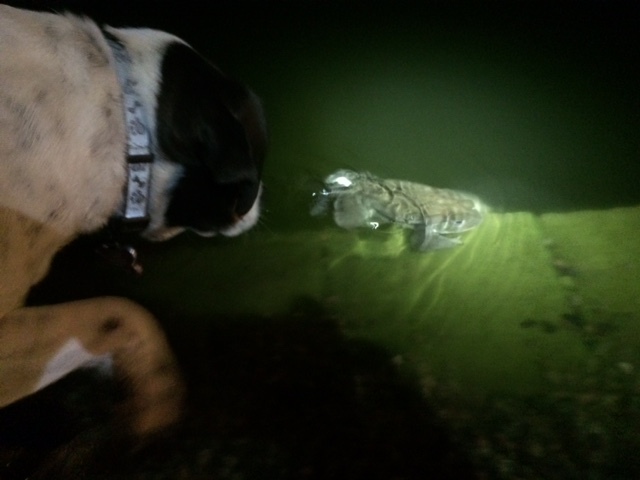 We’ve had a couple of bull frogs join us and they love to sing bull frog at night. . . . It drives the dogs nuts. The electrician came during the week and got my Sequence 9700 pump up and running. 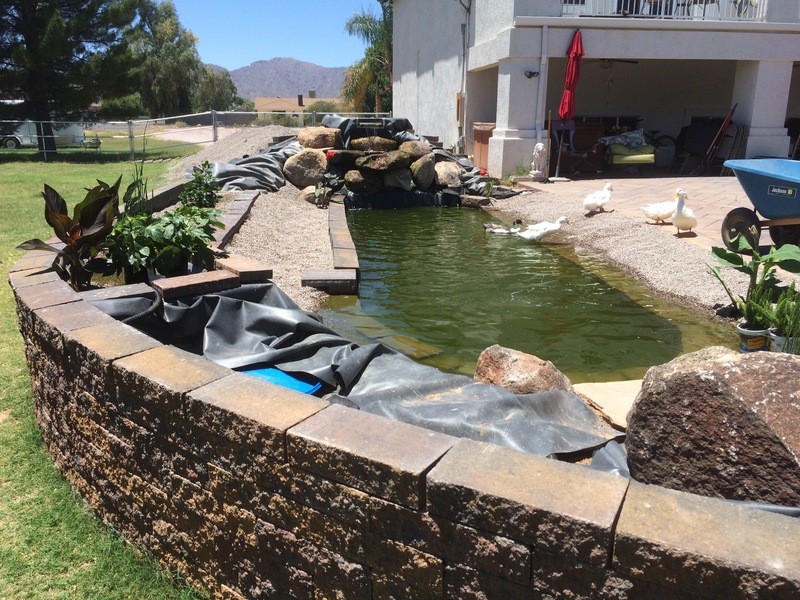 Initially the water began to clear, but because I was running two much smaller pumps, I think I had an algae clog in the end of my grow bed piping because the bed wasn’t filling very fast and the pond continued with its wonderful shade of green. I realized it was clogged and was able to clear it with a change in the pressure and water flow. Now the pond is cycling quite well and I am hopeful that over the next 48 to 72 hours it will begin to clear up so we can see the Koi. 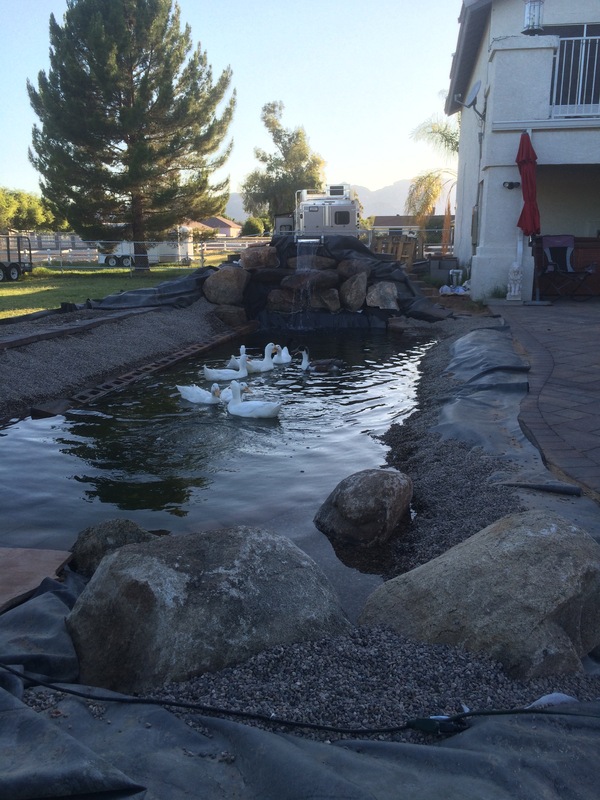 The ducks are loving the pond and have been fun to watch, but they keep eating my plants. 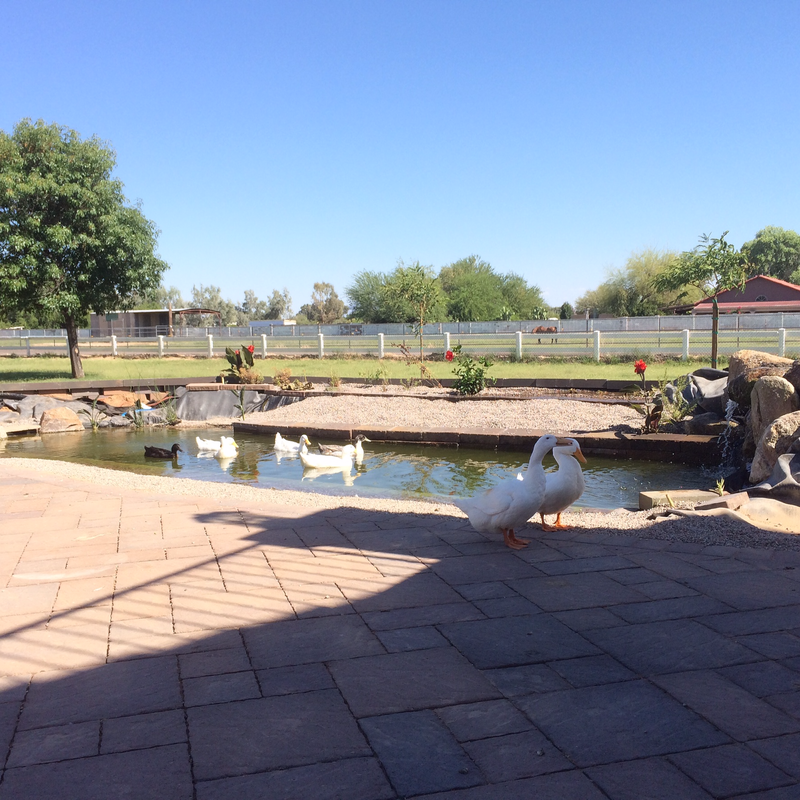 Listening to the sound of the water and the quack of the ducks is really one of the most relaxing things I’ve found to do while sitting on my porch on a Sunday afternoon. 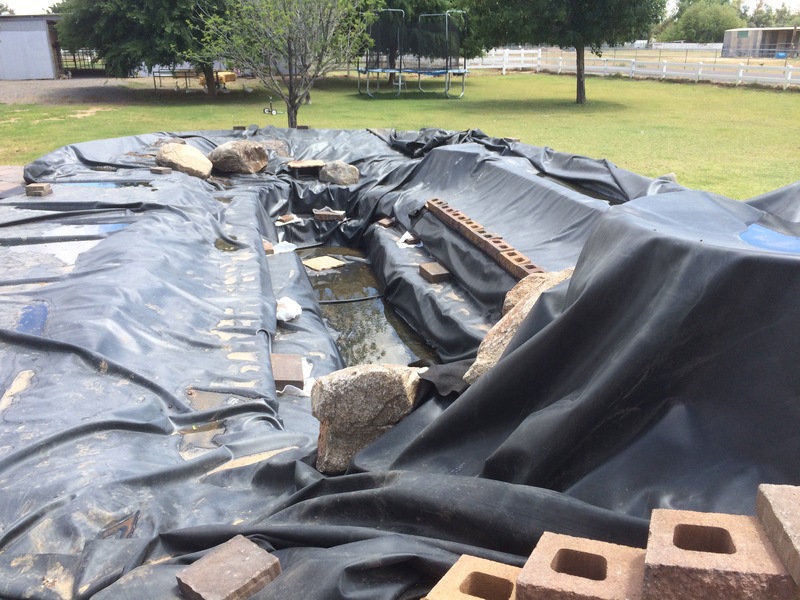 So, now as the water cycles and begins to balance itself, the next step is to finish bringing in the boulders, rock and landscape the perimeter of the pond. The project that I thought would only take two to three months is now on month eight. But I have learned a great deal and lost a few pounds in the process. 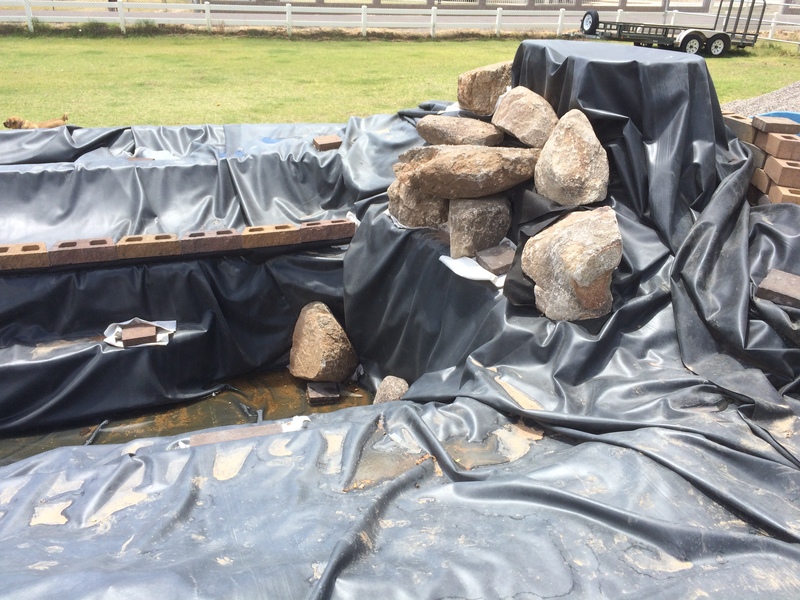 Here are the pictures of further progress since the liner and stones have been placed. 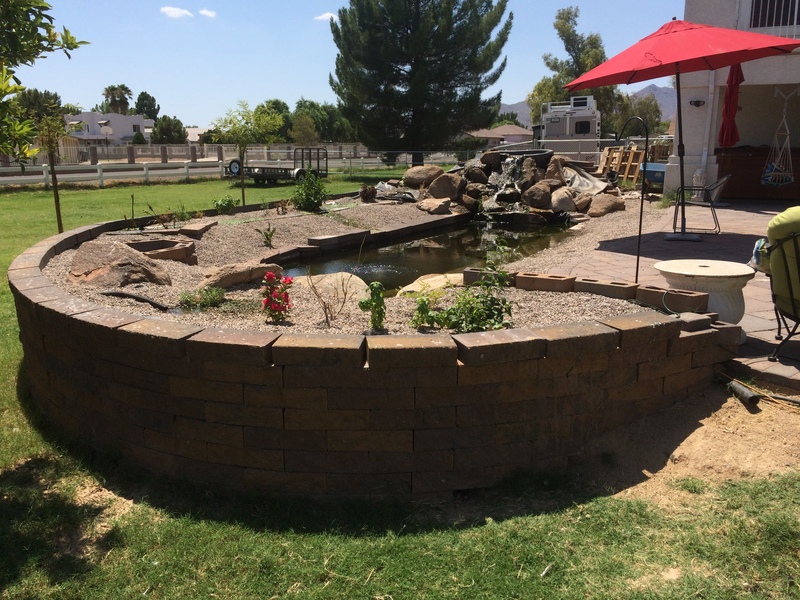 I am still waiting for additional stone to fill in the gaps. 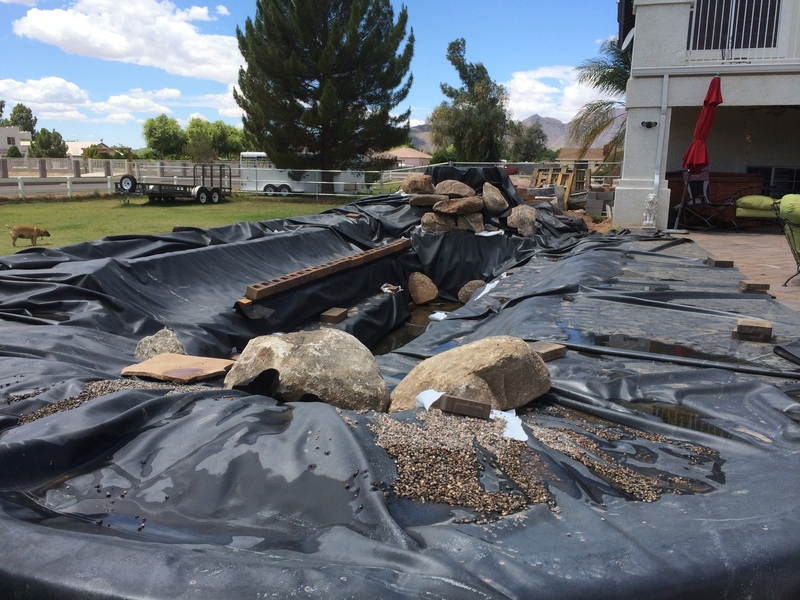 I placed the liner and after a rain storm and irrigation lifted the liner and rock in the base, I decided filling it would hold it in place much more effectively. 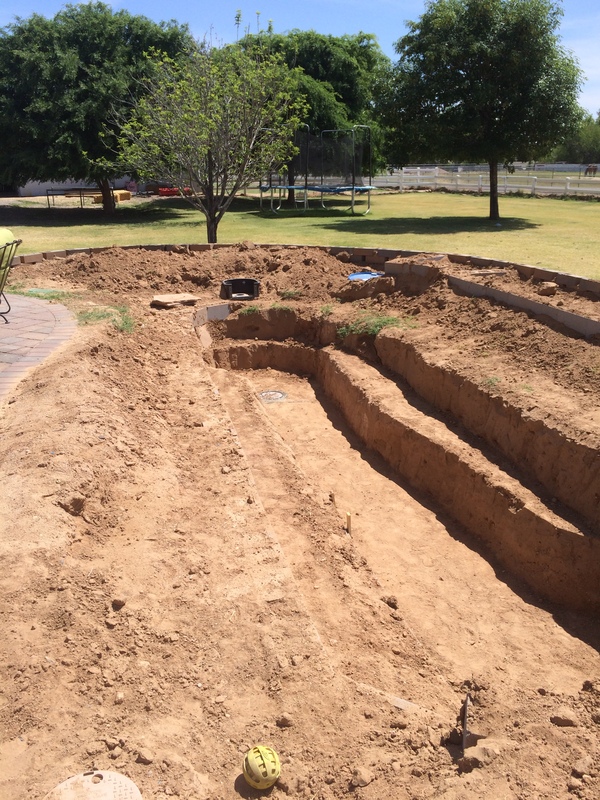 Bottom drain bubbler was inserted and the water filling began. 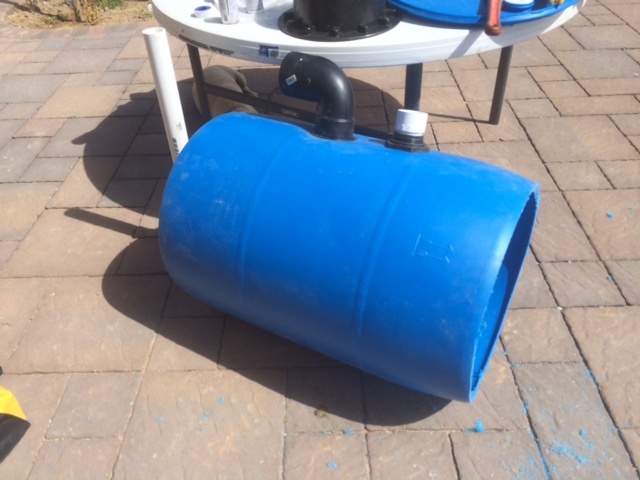 I put pea gravel into the grow bed and bog areas and while waiting for the electrician to finish the wiring on my big pump, I temporarily inset my small aquaponics pumps into the swirl tank and skimmer to get the water moving. The ducks love it. So do the dogs. I found some water lillies and horsetail at Home Depot and added them to the grow beds to get things started. 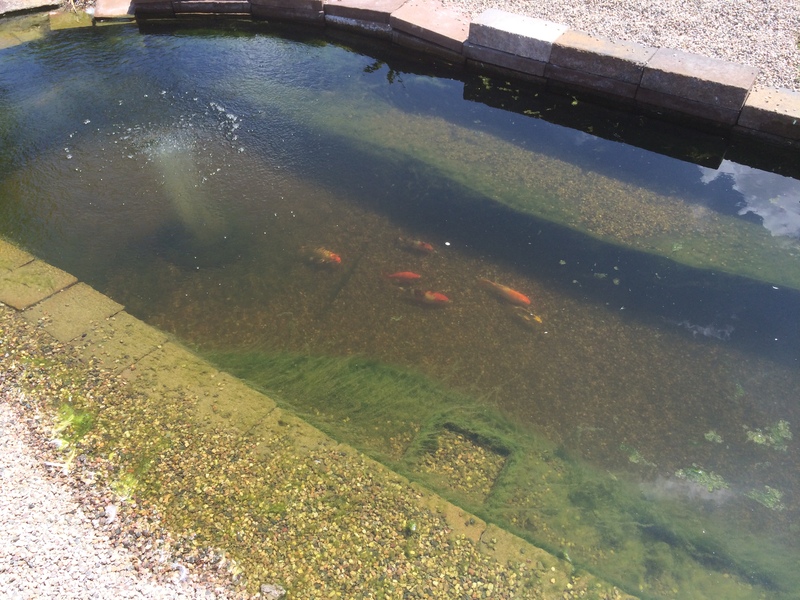 I’ve included video below explaining how the pond works. 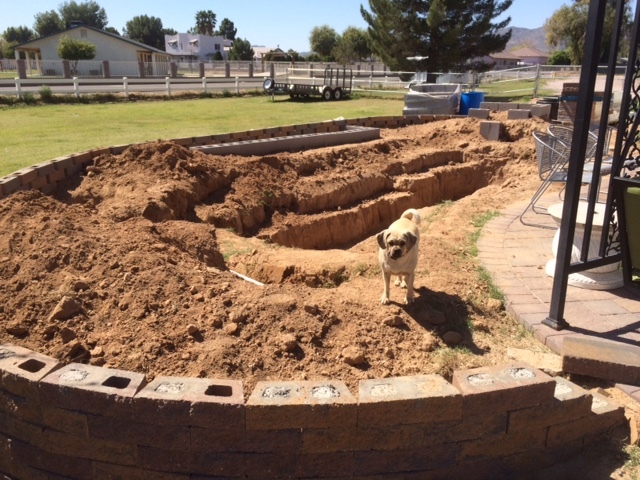 Little by little it is getting completed. Had some time last week. 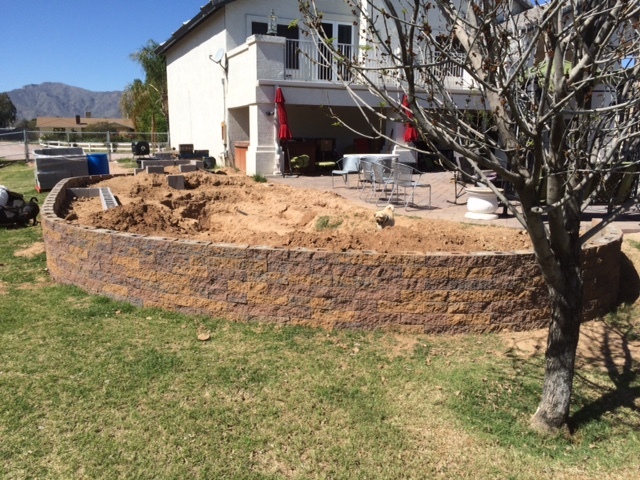 Took time to shore up the walls, smooth out the rough areas, and level the bottom. 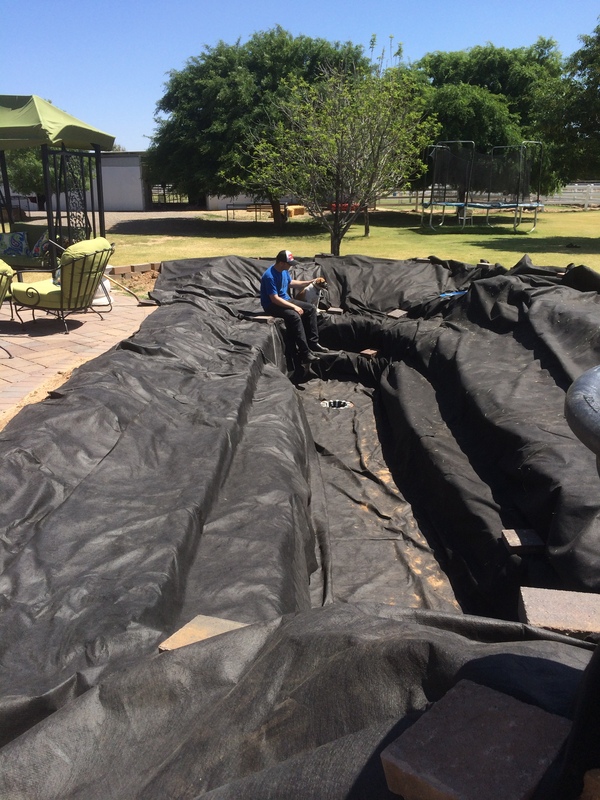 I pulled out the underlay material and my son and I lined the pond bottom in preparation for the rubber liner. 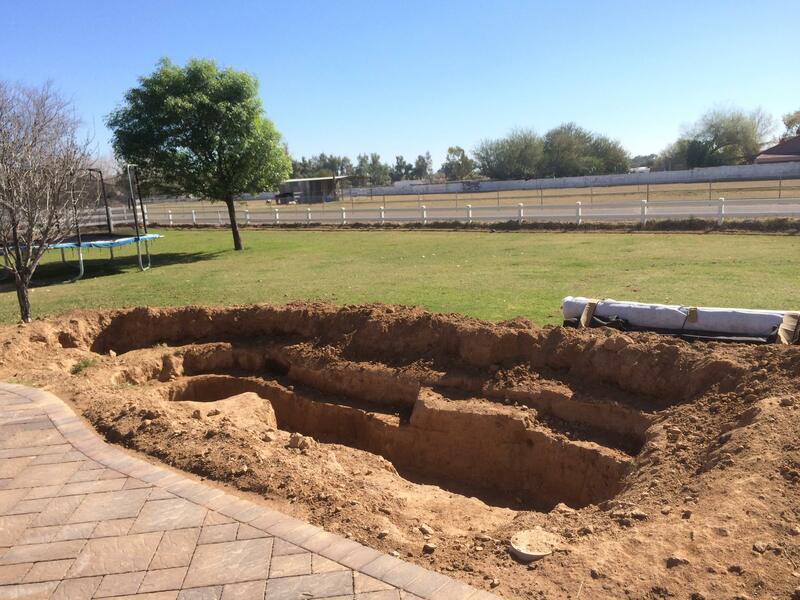 I called up my family and coaxed them over to the house to roll out the 700lb liner . . . Stay tuned for the moment of truth. 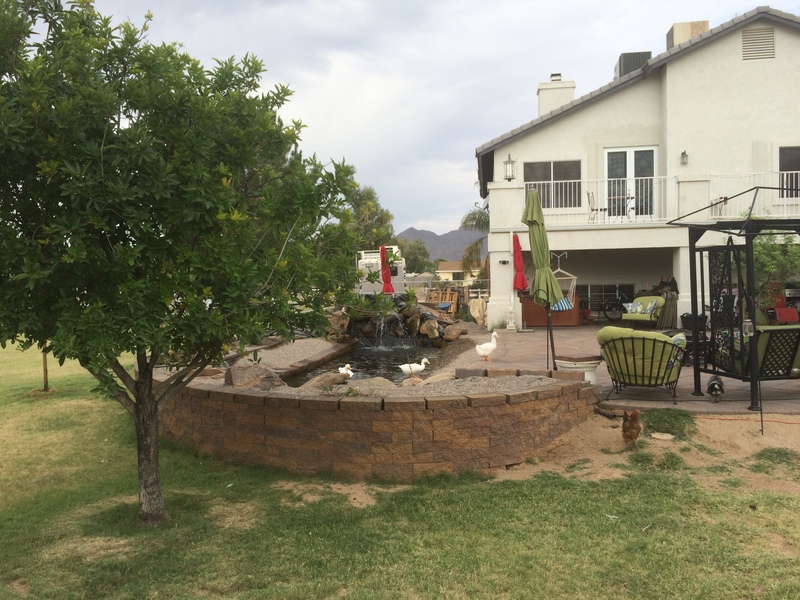 I’ve been working on this pond now for the last four months. 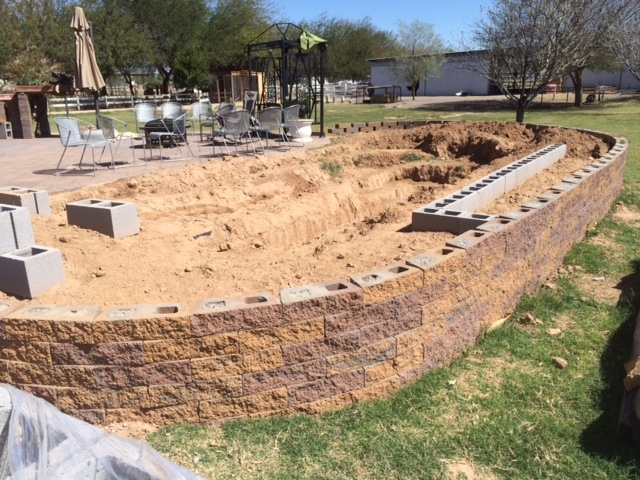 Little by little it is taking shape. 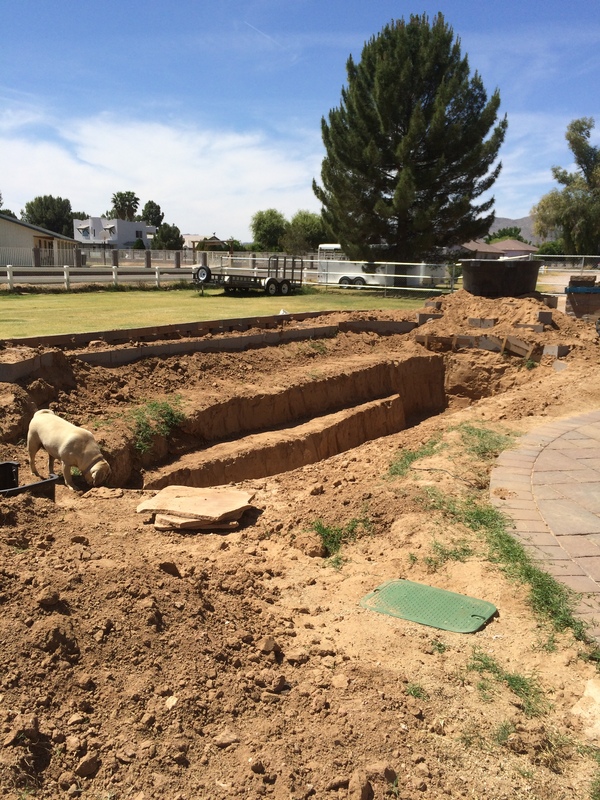 I never realized it would take this long, but I have learned a great deal about pre-pond design, making walls, plumbing and filtration. 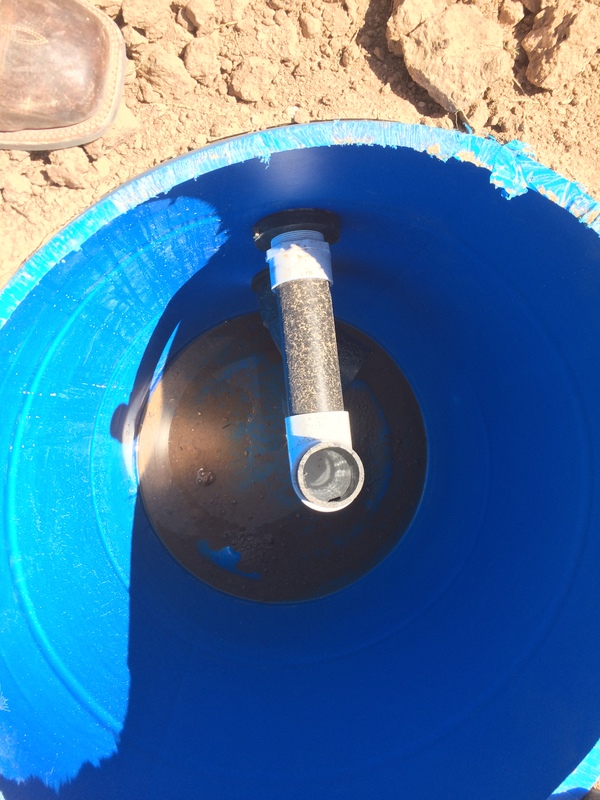 I placed my bottom drain, swirl filter, skimmer and found a large water trough to use at the top of the waterfall. 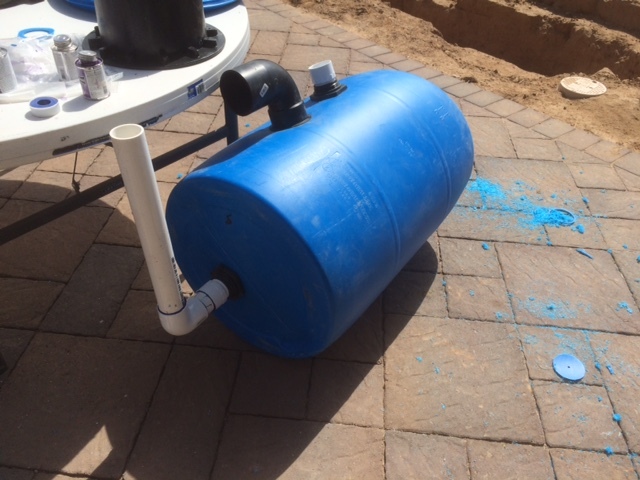 The swirl filter was designed by cutting the top off a 55 gallon barrel below. 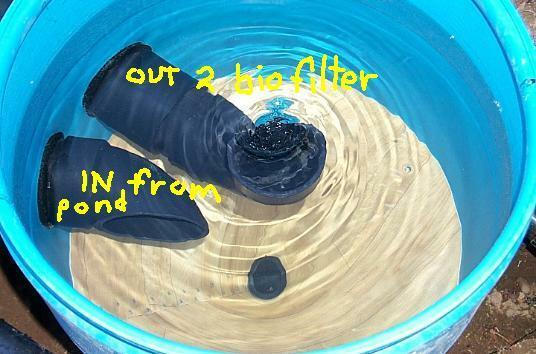 Once the filter was placed, I filled in the area and this is what it looks like from the top. 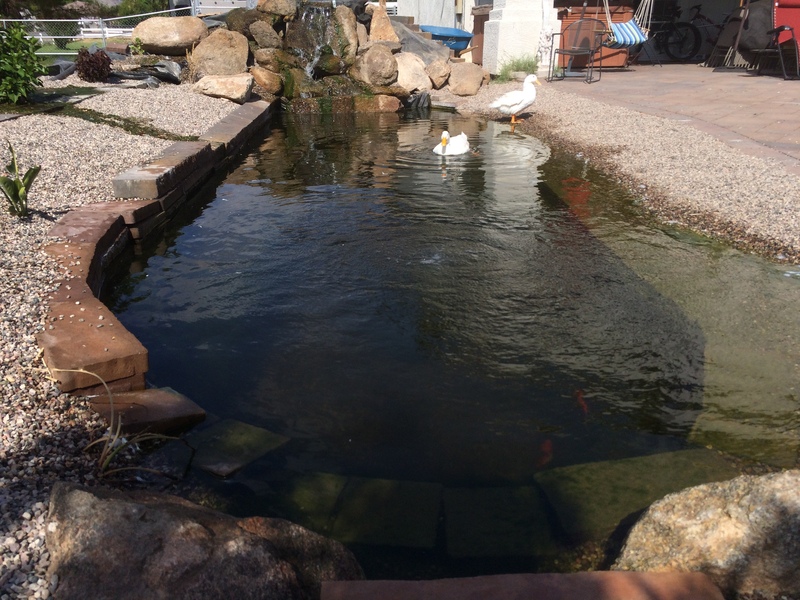 I decided on the Koi Toilet from The Pond Outlet and I’m hoping that the 4″ drain will accommodate for the ducks. I’ve reinforced the waterfall base with cinder block and used a 100 gallon water trough as the waterfall collection tank. this way I can plant some plants in the top of the trough that will further hide the waterfall. 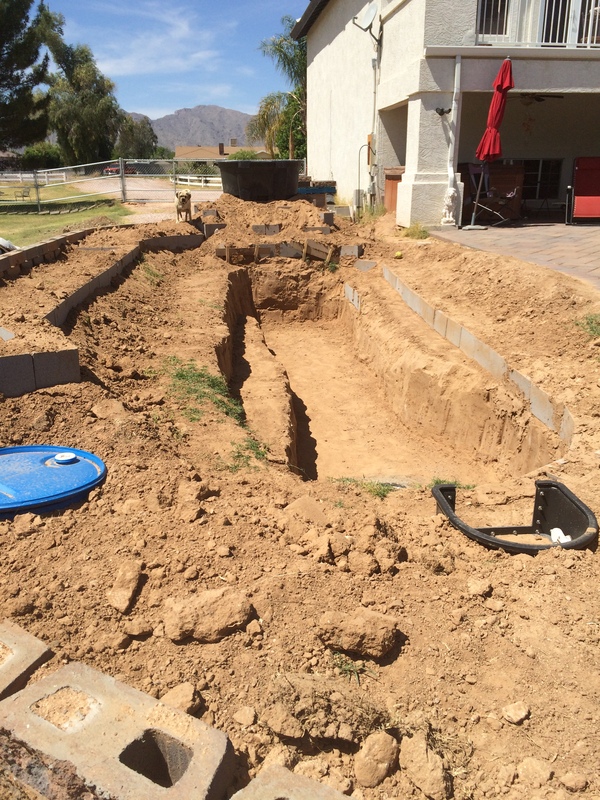 So, the next step is to begin laying the underlayment to protect the liner from holes. Stay tuned . 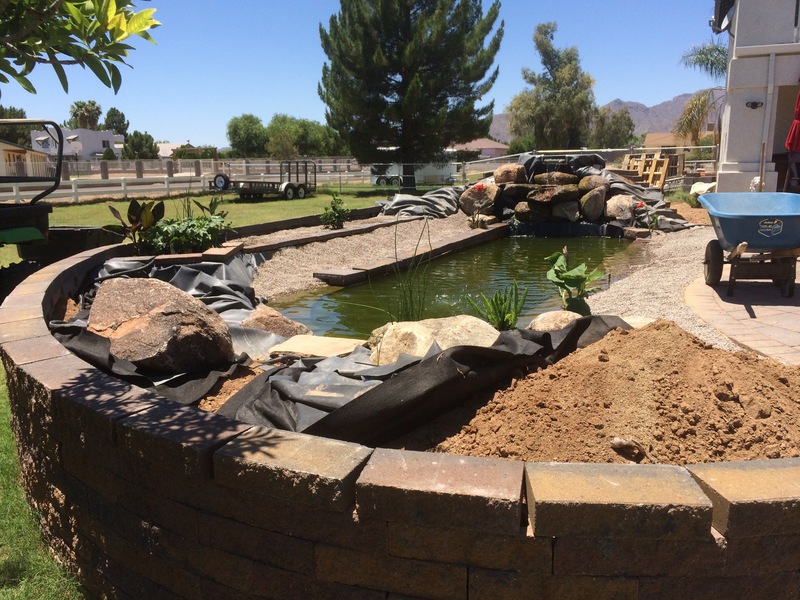 . .
Koi Pond & Aquaponics Garden Progress . 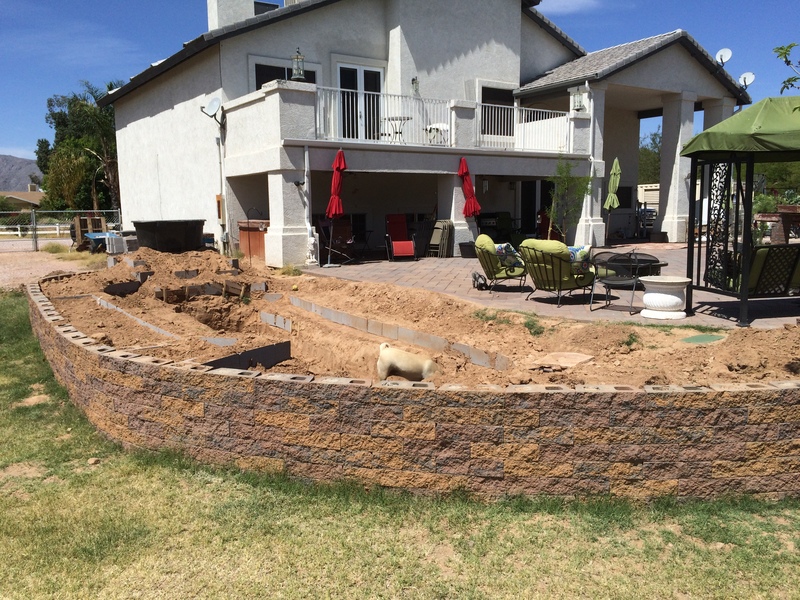 . .
I’m waiting for some block to finish the south wall of the koi pond. 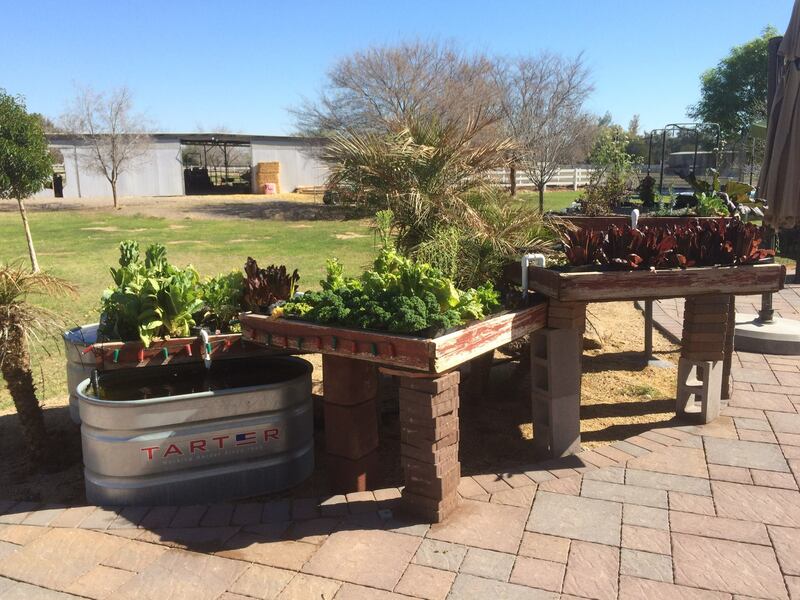 The aquaponics garden is growing really well and survived the Arizona winter cold.